• Golden Retriever dog breeders are listed below alphabetically by State / city. • Click on underlined words to find Golden Retriever puppies for sale. • Please tell the Golden Retriever breeders with puppies for sale that you found them on BreedersClub.net. Most colors are represented here, including English Cream, light yellows to dark golden reds. American Champion sired. Parents OFA certified; eyes, and heart; Health guaranteed. Superb looking pups, blondes to medium gold, blocky heads. Bred for excellence and raised with loving care, these water-loving dogs are excellent gun, guide, and service dogs, as well as gentle, devoted family companions! Breeding since 1984. We are a small conscientious breeder that uses a Proprietary Holistic and homeopathic approach to breeding our beautiful AKC Certified puppies. We take a natural approach to good-health and specialize in the area of longevity, personality, beauty and the prevention of cancer and disease. . . Everything your puppy is and will ever be started in the womb. This is where we begin to focus our utmost attention. 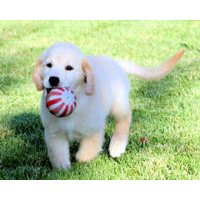 As a conscientious and responsible breeder, all our Golden's are given the Best Nutrition possible each and every day. We have been raising AKC/OFA puppies for 18 plus years and strive to provide families with superior temperaments, bone structure and stunning coats.Each puppy is very well socialized with our family and comes complete with with a 6 week vet exam and kept UTD on all vet care. We also provide 1 a year genetic health guarantee. Our bloodlines are imported from some of the top show kennels in Europe and are genetically tested. Check us out! I have been breeding dogs for over 30 yrs. I have passed the love of dogs unto my 2 children who are every active in our breeding program. We are a license kennel in the state of PA. We live on a small farm . Where our dogs get to run and play. Pups are from health tested parents . Our breeding stock has been selected from top breeding kennel. May of our dogs are Int/Nat Ch . All pups are Micro-chipped,Dew-claws removed, current on vaccines, dewormed, vet checked and come with a 2 yr warranty. Pups are socialized , desensitized to loud sounds, exposed to household noises, start on crate training and house breaking. We are located in Central Texas. Our family has been raising high quality dogs for about 25 years. We register AKC, the oldest most highly regarded registry in the United States. Our dogs are not caged, and are very well socialized. AKC visits every couple of years to give us an inspection. We are proud to say we have got a perfect score. We also have a vet out twice a year to make sure everything is going well and provide shots for our adults. Puppies go to their new homes with 1st shots & wormed; ask about our health guarantee. Parents and sometimes grandparents are on site. Visitors are welcome to visit our house. 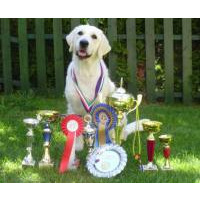 Healthy European bloodlines with exceptional temperament, grand stature and coat. AKC registered. We are committed to a breeding program that concentrates on health, temperament and characteristics consistent with the Breed Standard. Our pups have potential to succeed in the show or conformation ring, as well as successful therapy or rescue dogs, obedience competition, hunters out in the field or just curling up in your lap and being the best darn family pet you could ever want. We have been breeding 15 years. 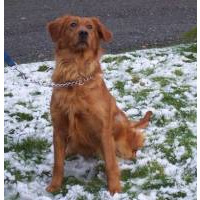 This breed directory page features Golden Retriever (including American, English Cream, etc.) dog breeders with puppies and/or adult dogs for sale. Once you purchase your new found friend, you will want to provide it the best in pet health care. Be sure to visit our online discount pet supplies catalog and order NuVet Plus™ to keep your puppy and adult dogs in top condition. The discount catalog also features collars, leashes, carriers, general pet care products and much more. BreedersClub.net does not pre-screen the Golden Retriever dog breeders who advertise their puppies and dogs for sale in the BreedersClub.net breeder directory and in the classified ads. We require all advertisers to agree to our advertising terms. 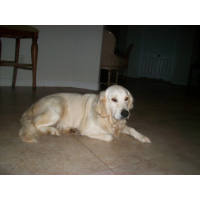 You should ask the $Golden Retriever dog breeders you talk with for references from past buyers and veterinarians.